This recipe for Chocolate & Peanut Butter pretzel sandwiches was sponsored by Snyders, but all thoughts are my own. I am so happy you’re here! Are YOU snack-challenged at your house? Heck, have you ever said that yourself? You are going to LOVE this delicious snack solution! I’m sure it won’t come as a big surprise that we go through a lot of snack foods at our house. And let’s just say that not all snack foods were created equal. Finding good foods that my family actually enjoys eating is not always easy. I don’t want to load my kids (or my grocery cart $$) up on sweets and junk food, but I do recognize the value of having snacks on hand….especially after a long day at school. Is snack time getting out of hand at your house? Need some snacking tips? Download my 5 healthy snacking tips PDF HERE! Ready for the recipe? 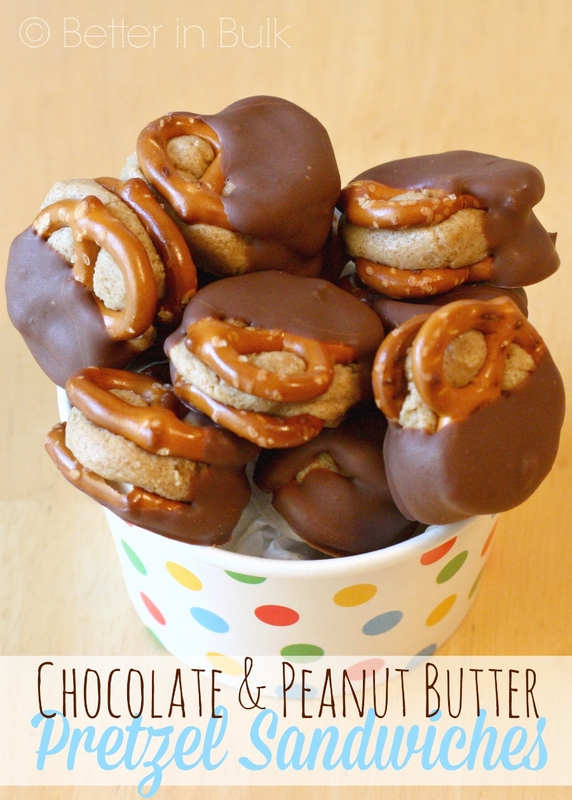 Click HERE to see how to make these delicious and easy chocolate-dipped peanut butter pretzel bites. © 2012 – 2017, Food Fun Family. All rights reserved. I would say they could keep 3-5 days in a covered container or ziploc bag. Ours got eaten up to fast! Such a simple but tasty treat! Thanks for sharing! I always love these at parties, so simple and delicious! Yum! These look tasty! I bet my family would love them! I just saw these on your site and I am going to have to make them asap! These look delicious!! What an absolutely delicious treat! I love the peanut butter and chocolate flavor combination, and this gives you a sweet & salty combination, too! Yum! I have a question when it says to add more sugar to make it not sticky….are you adding more of the brown sugar/powdered sugar combo?? Or is it regular white sugar??? That would be extra powdered sugar. I’ll clarify that in the recipe. Sorry about that! Your ingredients does not call for granulated sugar, is this a miss print and should it be conf sugar? Edited to add: the answer is powdered sugar. :) I didn’t realize this was in response to a comment. Where do you see the recipe call for granulated sugar? I only see powdered sugar mentioned. If there’s a mistake, I definitely want to correct it, but I couldn’t find granulated sugar in the recipe. Thanks! Lolli, in your response to Crystal’s question, you said that you add more granulated sugar as needed but the recipe doesn’t call for granulated sugar. Do you add extra brown sugar or powdered? Monica, Thank you for pointing that out! I was combing through the recipe, confused, and didn’t realize the question was in response to a comment (I don’t see that on my end when I receive comments). The answer should have stated powdered sugar, not granulated sugar. So sorry about the mix up! Holy Smokes. I just made these and they are amazing! I brought them to work for a taste test and they are getting rave reviews! Slurp! What a treat!! Looks scrumptious!! Thank you for linking up with us at #HomeMattersParty . We would love to have you again next week. my oh my! This looks so yummy! Thanks for sharing! found your blog on pinterest blog hop, new follower. Love a visit when you get a chance and love working with pretzels to make candy…..can’t get tired of that combo. How yummy! I haven’t been to your blog in awhile! Love all the photos. Stop over and link this post up to our Saturday Pintrest Party and I will pin it for you! Thanks for linking up!! I gave you a big fat pin! That Chocolate & Peanut Butter Pretzel Sandwiches recipe looks so delicious! This is a great snack to serve the children.